Limited company or sole trader: what’s the difference? Homepage > Help me decide > FAQs > Limited company or sole trader: what’s the difference? Starting your own business and making the step to working for yourself can be an exciting yet daunting time. One of your first decisions will be to decide whether to run your business as a sole trader or a limited company, but what exactly is the difference? There’s no one-size-fits-all solution and deciding the best business structure to use should be based on your own personal circumstances. Thankfully, you won’t have to go it alone. We’ve created the below table and guide to highlight the similarities and differences between the two options, letting you see at a glance what to expect with each one. Choosing to run your business as a sole trader means that you are personally responsible for your business. You can hire staff, but your business is owned and controlled by just one person; you. As such, the law sees your business and yourself as the same which means you are personally liable for any losses or debts that your business makes. Of course, this does mean that you can keep any after-tax profits. Often it is business owners who provide a specialist service such as hairdressers, plumbers or electricians who choose to run their businesses as sole traders. As the sole owner, you can keep all of your business’ profits. You are fully liable for any loss your business makes, so you may have to use your own money to repay any debts. There’s no one to share accountability with. Whilst you can hire staff, any and all important business decisions fall to you. If you choose to run your business as a limited company, this means you will be setting up a private organisation to run your business. Your business will then have its own legal identity separate to yours and its finances will be kept separate from your personal finances. As director of your limited company, this means you will have limited liability on any losses or debts incurred by the business. You can find out more about limited company’s on our limited company guide. As director of a limited company, you can pay yourself in a combination of salary and dividends. With dividends having a lower tax threshold than salaried pay, this can mean you are much more tax-efficient than when just paying yourself a salary. All shareholders have a limited liability should your business incur losses or debt; it’s not your personal responsibility. Should you ever wish to leave your business, there are likely to be more opportunities for a clean break from a limited company than other business structures. There may be more difficult and time-consuming administrative and tax requirements running a limited company as opposed to operating as a sole trader. However, this is where a specialist contractor accountant like ClearSky can help. 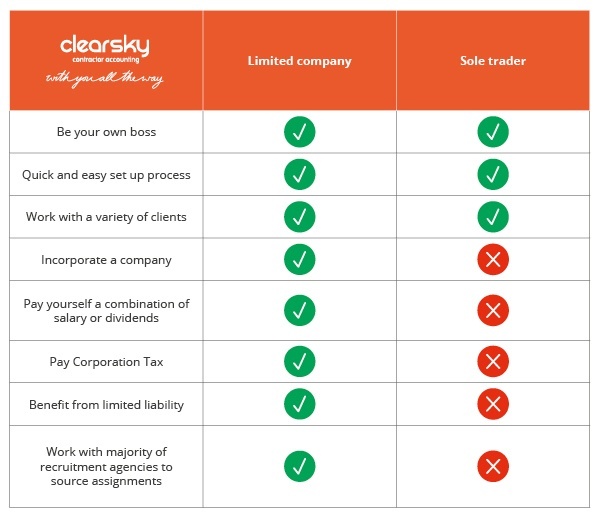 What is the difference between a sole trader and a limited company? The overall biggest difference between a sole trader and a limited company is that a sole trader is owned and controlled by one person who has unlimited personal liability for the business whereas a limited company will have its ownership split into equal shares. The shareholders of a limited company have limited liability for the business, this may mean that there is less personal monetary risk involved when choosing to set up your business as a limited company. At ClearSky Contractor Accounting, it's our mission to help you cut out the amount of admin you are faced with and to help you simplify those tasks that get in the way of you doing what you do best; your job. We’re committed to providing you with the best advice. We’ll recommend the business structure based on what matters most to you, leaving you safe in the knowledge that you’re on the right path. We'll be with you all the way throughout your career, offering advice and support whenever you need it. We understand that your WorkStyle won’t just be 9-5, so neither are we. Our online portal lets you manage your account any time day or night, while our extended opening hours mean you’ll be able to speak to a member of our team at a time that suits you. For more information, or to join up, please call 0800 032 5326 or email enquiry@clearskyaccounting.co.uk. Are limited companies tax efficient? Limited companies are rumoured to be extremely tax efficient, but is this true? Our handy guide will give you the facts. What business structure should a contractor or freelancer use? So you’ve decided to become your own boss. The next step is to decide what structure you’ll use. Our guide can help. How much do I pay myself as a limited company director? As company director, you can pay yourself a salary and dividends. How much? Learn from our guide. Does a limited company need to be VAT registered? Vexed by VAT? Know the difference between standard and flat rate? We’ll help you with this handy guide.